Reading Stead’s new collection, I was reminded of another of his poems: Sonnet. hang like mobiles in a grandchild’s bedroom. might clap a bag over your breathless soul? has taken upon itself the mantle of beauty. 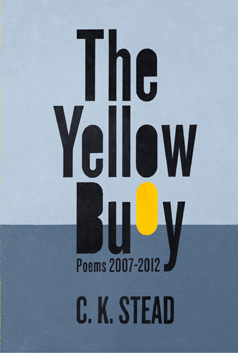 The Yellow Buoy is mostly set in Europe, where Stead spends spends several months of each year now. Italy, France, Croatia as well as Colombia and Venezuela all get a mention, but often returning to weave in references to Kiwi poets and New Zealand customs when the reader least expects it. A recurring theme is the piwakawaka. In some Maori legends, the bird is a sign of impending death when it appears inside a house. Stead mentions the famous Maori myth about how death goddess Hine-nui-te-po killed Maui because the fantail couldn’t stop laughing as he tried to climb inside her, describing the twittering bird as “script-writer also of dark memorials”. More prosaically, he also talks about how a fantail likes to hover around his compost bin, waiting for the lid to be lifted so it can catch fruit flies. The poem before it, Isola Bella, was written for the 2008 Katherine Mansfield Centenary Conference in London. In the poem, Stead rehearses what he would say to Mansfield if they met in Menton, near Provence – “Friend or foe?” she calls to him. I can see why Mansfield would appeal to Stead. Both writers strongly identify with New Zealand but prefer to spend large chunks of their lives overseas, and both prize clarity and directness in their work over all else. This is Stead’s fifteenth collection and Mansfield is not the only writer he talks about. Many others known to me and others and some not, Eugenio Montale and Carlo Vita are referenced in some way. But fear not, this is a collection with enough depth to dive but shallow enough not to drown. And there are simpleobservations that don’t need much to appreciate like Names: about a cat Debussy and the fantasies of his owner to travel once the commitment of his life has gone. To finish, I have to steal from the liner notes: “These poems wisely urge the reader to stay alert, to pay attention , to the ‘poetic moment / so easily missed / so quickly lost ‘. “ Indeed! You can read more about CK Stead on his biography page at NZ Book Council Website. This entry was posted in Uncategorized and tagged CK Stead; Karl; The Yellow Buoy; Sleeping Dogs; Auckland University Press; Katherine Mansfield by timgruar. Bookmark the permalink.